Over the past decade, Mattel, Lego, and Nerf have all made their products transition from hand-held toys to the video game medium. Now, the vintage 1960s toy Lite-Brite from Hasbro has been adapted for the iPhone by Electronic Arts. Sadly, regardless of the nostalgia factor, some toys just shouldn’t be iPhone games. On the plus side, what used to take minutes to complete takes seconds with the iPhone app. For those who don’t know, Lite-Brite is a square board filled with very small circular light sockets. The toy includes LED lights of varying colors, which you can place in any pattern on the black-matted board to make glowing visual masterpieces. In reality, you and your kid sister probably stopped trying to make the “clown” pattern after about five minutes, got bored, and never touched the toy again. 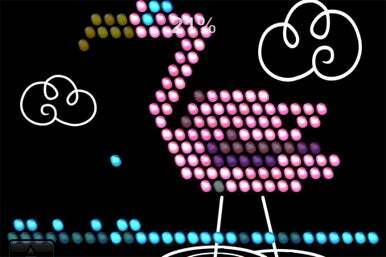 EA’s Lite-Brite transforms your iPhone into an electronic light board. With your finger, you can string digitally rendered colored LED lights into recognizable patterns. In addition to the normal electronic board, the game offers a paint-by-numbers option, as well as an animation option. In the paint-by-number mode, you have to fill in already drawn images with certain pre-designated LED lights. In the animation mode, as you probably suspect, you can make animations with your LED drawings. It’s the only fun part of the "game." To animate, the game allows you to make copies of your Lite-Brite board, make slight adjustments to each copy (add additional lights, delete lights, etc), then string all the copies together into a film strip that when run, will show a visually pleasing cartoon. I imagine the ten-year old boy in you will enjoy being able to create an LED monster, animate it, and then have it wreak destruction on your iPhone screen—and really, who wouldn't? When you get down to it, the iPhone Lite-Brite app is less a game, and more of a drawing app. Even worse, it is an extremely limited drawing app. You have a limited number colors to draw with, you can’t draw straight lines (as light sockets aren’t in straight lines), you have to draw on a black, unappealing background. EA had an opportunity to push the Lite-Brite brand into a new direction by offering something more than what you got out of the dated toy. Instead, the thin fun value of the product shines like an LED light. The brilliance of the original Lite-Brite is that you get to create bright, vibrant electronic drawings. The iPhone doesn’t have the screen to create such vibrant pictures. So, why not buy a regular Lite-Brite? Well, the app is 99 cents, while a regular Lite-Brite is $11. If you want to recreate the early ’90’s for cheap, then I suppose this is one way to do it.